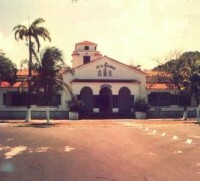 Fernando Noronha facility, located on a small volcanic island 210 miles off the eastern coast of Brazil, was established by the Army in an agreement with the Brazilian government in early 1943. It was established as a naval air facility on 26 November 1943. The U.S. Navy utilized the field to support patrol squadron detachments of up to six aircraft, usually the shorter range PV-1 Ventura land planes of VPBs 125, 134 and 145, operating out of Fortaleza, Brazil. VPBs 45 and 94 also deployed detachments to this facility. The NAF portion of the base was disestablished on 30 June 1945. Fernando Noronha served since 1942 until 1945 as the main Brazilian military outpost in South Atlantic. The war caused a thorough modification on the main island when several facilities were built or enlarged in order to garrison 3 000 troops. A new 6000 foot runway was built to receive VP squadrons of PBY 5 Catalinas. Gun emplacements as well as anti aircraft batteries were placed around the island. 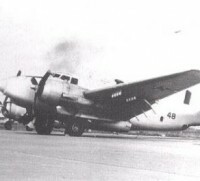 On 7 JUN 44, a detachment of Catalinas was sent to NAF Noronha to conduct a series of daily sector sweeps on A/S patrols. Facilities at this tiny base located 210 miles of northeastern coast of Brazil were cramped and primitive. Squadron VP-45 shared the base with PV 1 Ventura land planes detachments from VB 125, 134 and 145 based out of NAF PICI Field at Fortaleza. South Atlantic. These anti aircraft guns where in the same batch of the coastal batteries Brazil acquired at the beginning of the hostilities. 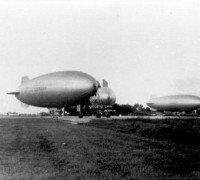 Shipments arrived in 1941. Photo kindly sent by Mrs. Marietta Borges. Pictures show Brazilian Army US Vickers Mk XIX 152.4 mm (3") guns.99 of these guns (a large number of these British guns was manufactured during WW1 for theUSA) were sold by the USA to Brazil during 1940. The island was converted into a fortress and the easternmost outpost of South American continent with intense Anti submarine patrol sweeps. Photo kindly sent by Mrs. Marietta Borges. 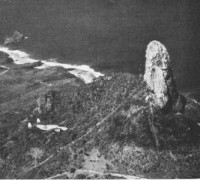 The tiny idyllic island of Fernando Noronha 295 miles off Recife was an important support base for patrolling duties in south Atlantic. Served as refueling point for the ever increasing USA Army air force planes bound for Africa. Also one US Navy VP squadron with Pby-5 Catalinas was stationed there. The picture above shows the treeless island seen from German dirigible Zeppelin circa 1937.